Choose from the best Fiji family resorts and hotels for your holidays with the kids. Fiji is a great place for relaxing family travel with amazing beaches, fascinating culture and beautiful rainforests. 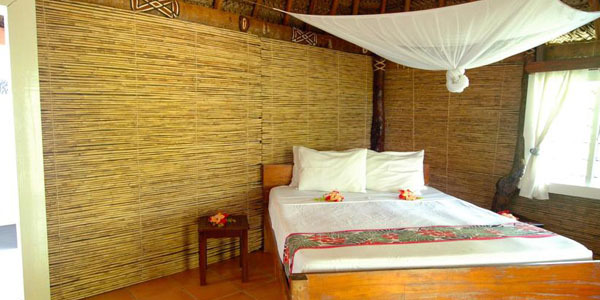 Many Fijian family resorts offer accommodation in a traditional styled bure (pronounced bor-ray). These bungalows are built with natural materials and often have a thatch roof and offer a wonderful Fiji experience for families. These are the best secluded island Fiji family resorts with excellent kid's clubs, cheap family rooms, or luxury accommodations with all the amenities. 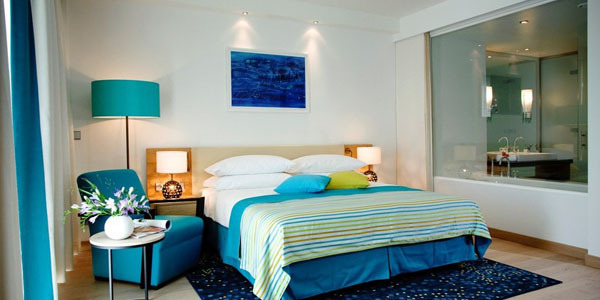 Radisson Blu is one of the luxury hotels located on Denauru Island. It is located on the beach. 5 lagoon style swimming pools with a waterslide. Kid's club for ages 4-12. Standard rooms can sleep 2 adults and 2 children (pull out couch). 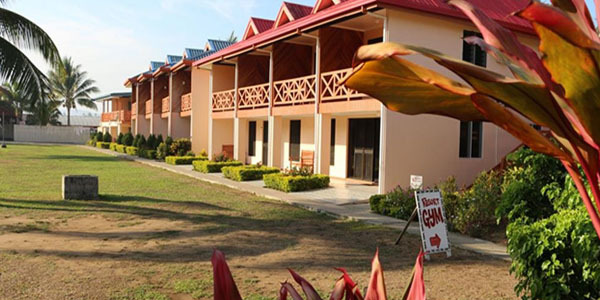 This is one of the best family resorts located on the main island, Viti Levu near Sigatoka. It is a 5 star resort offering a butler service. They often have kids eat free specials. Meimei service (nanny for ages 6 months-12 years) for a fee. Located on the beach and has a pool and children's playground. Family bure can sleep a family of 5 or 6. 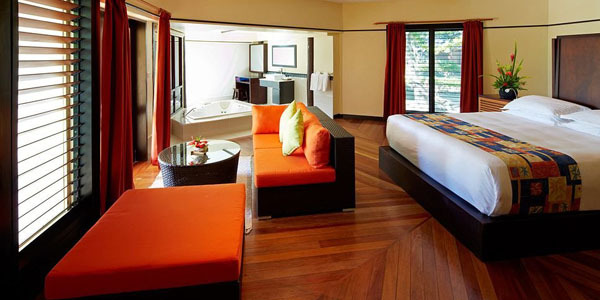 Shangri La is located on the beautiful private Yanuca Island and is one of the best 5 star Fiji family resorts. This hotel is conveniently connected to the mainland by a causeway. 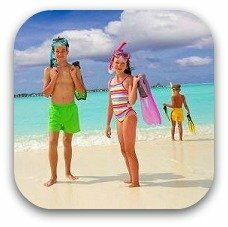 Children's activity program for ages 4 and up with fun games at the beach, children's pool or playground. (Children under 4 may attend with a babysitter). Often offer a kid's stay and eat free program. 2 adults and one child (you can request to have another child in the room directly with the hotel). Jean Micheal Custeau is located on the other big island of Fiji (Vanua Levu). 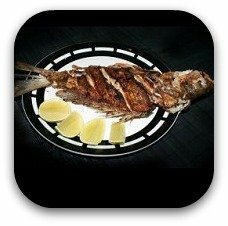 It offers all inclusive packages. 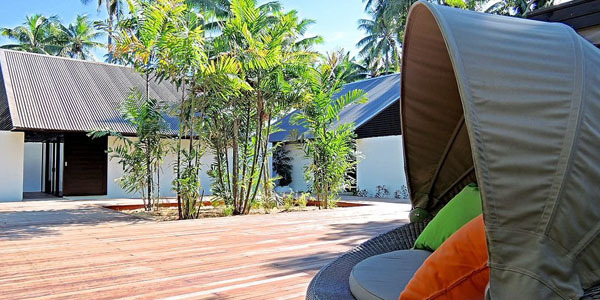 They are an eco-friendly Fiji hotel and have a full time biologist on site. Kid's club for ages 6-12. Bures that can sleep a family of 4 or 5. 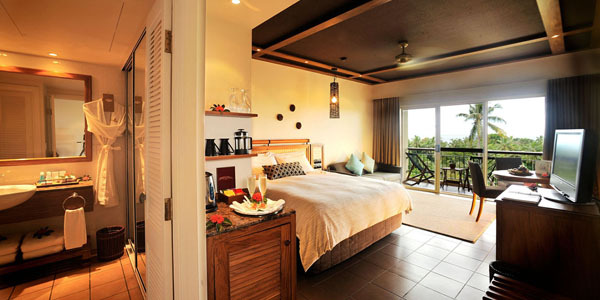 Mana is is located in the Mamanuca chain of islands close to Nadi and has beautiful white sand beaches. The kid's club- It is one of the best in Fiji with lots of fun activities to introduce your children to the Fijian culture. Ages 3-12 (small one time registration fee). Two pools, a playground and games room. Treasure Island is a beautiful resort in the Mamanuca Islands that is shared with its Fijian landowners. It is the only Fiji family hotel to offer same day transfer to the island. Fabulous kids club for ages 3 and up. They have lots of cultural activities including making a lovo feast and putting on a Meke performance for the children. Pool for babies and toddlers. 2 kids can stay free in the room with parents. Accommodation is in traditional styled bures -the standard bures can sleep a family of 4. 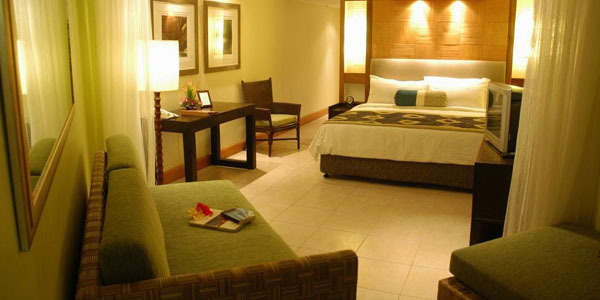 Castaway Island is a very popular 4 star Fiji family resort. It is located on a private island in the Mamanuca group of islands. 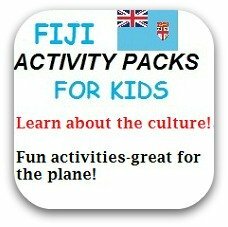 Excellent kids club (ages 3-12) with plenty of fun Fijian cultural activities. The kids club runs all day and in the evening too and it is free! Family accommodation in traditional bures that can sleep 4 (a family of 5 can be accommodated with an additional rollaway-fee). 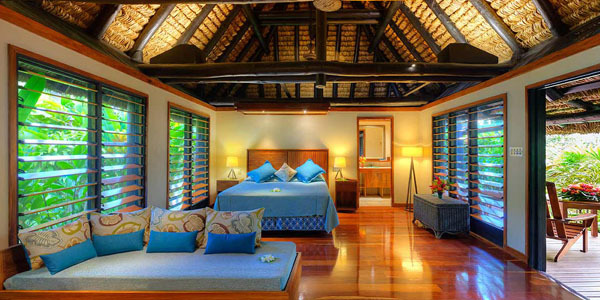 Malolo Resort is one of the rustic Fiji family resorts and is 100% Fijian owned. 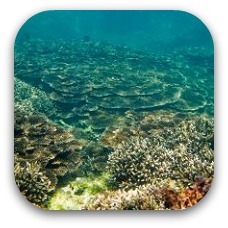 It is located on Malolo island which is part of the Mamanuca islands. Lots of watersports including banana boat rides! Traditional bures that can sleep a family of 4 including some that have separate rooms for the kids. Family bures that can sleep up to 7. 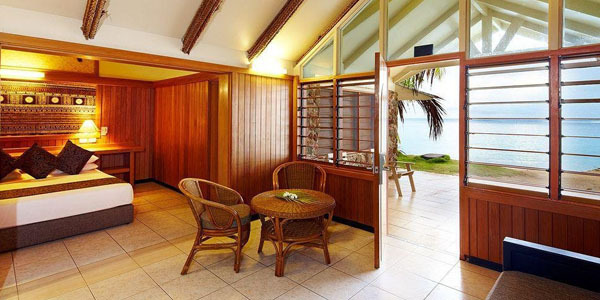 Raffles is one of the airport stopover Fiji family resorts or hotels. 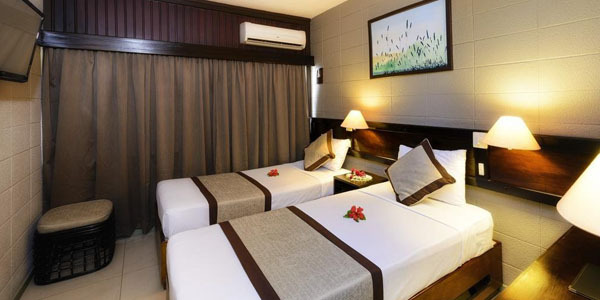 It is conveniently located within walking distance of the Nadi airport. Family rooms that can sleep two adults and two children. (2 kids under 16 stay free with parents). 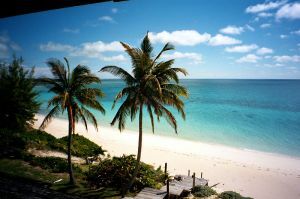 Plantation Island offers affordable accommodations for families located on one of the Mamanuca Islands with beautiful white sand beaches. Free kids club with lots of interesting activities. Nanny and babysitting is available for a fee. Family rooms or traditional bures. 2 children under 16 can stay free in the room with parents. A family of 8 can sleep in two rooms (extra fee for roll-away). 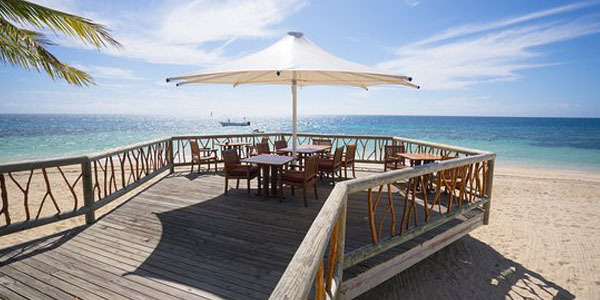 Octopus is an eco friendly cheap Fiji family hotel located in the Yasawa Islands. The island is shared with a local village. They partner with the local village to help fund a kindergarten for the children and also to help cover the cost of boarding school for older children who must leave the island to receive education. Donations of old toys, books and children's clothes are greatly appreciated. 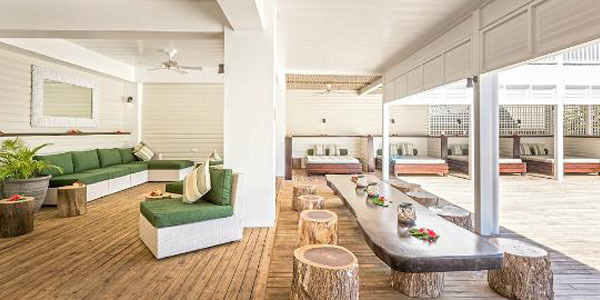 Staying at this resort is a great way to get back to the basics with no phones, computers, TVs or playstations. Children's meals are offered and babysitting can be arranged (fee). Private bures that can sleep a family of 5. Watch the video for Octopus Resort! 10 minutes to the beach! Rooms that can sleep 5. Plan your Fiji family vacation here! 14 Fun things to do in Fiji with kids!